Why is the holistic approach to health so beneficial? 12 Feb Why is the holistic approach to health so beneficial? This article is focused on the importance of the benefits of holistic and complementary medicine and why adding it to your own health care and really creates wellness. Our aim is to create total awareness as regard to holistic medicine, share its benefits in total health care, and offer you choice in the knowing. It is fact that total wellness is not achieved based on medical choices alone, holistic choices are tested and true. Experts have discovered that the path to wellness entails specific features. In the light of this, there’s a new website and App on the market called, WellnessWrx. Their aim is providing services that connect you to total wellness, offering consumers choice. Special healing and complementary services that look at the whole person is holistic medicine,’’ whole’’ in this context is the keyword. [body, mind, spirit, and emotions]. Any form of imbalance or negativity posed at the interdependent part that makes a whole person affects their overall health. Conventional medications and alternative therapies are tools used by wellness providers to treat their patients. Wellness and Holistic Providers work with the whole person. Every individual is responsible for his or her wellbeing, but the impact of unconditional love cannot be overly emphasized. Every human has innate healing powers. A patient or client is a person, not a disease. As regards to total healing, the patient and wellness providers will work together, it’s a team effort. Treating a patient involves tackling the cause of condition not just alleviating the symptoms. Today, choice is not an option, but an opportunity to create the wellness you deserve, in all areas of your life! Knowing that there are accredited professional services in various sectors with experts in each of the fields, is something to add to your life, so your lifestyle becomes fulfilled, mentally, emotionally, physically and spiritually. Holistic Counselling; This focuses on facilitating personal and interpersonal functioning across the life span. It pays attention to emotional, social, vocational, educational, health-related, developmental and organizational concerns. Holistic Nutritionist: A holistic nutritionist is a natural health and wellness practitioner that incorporates evidence-based methods for diet, supplementation, lifestyle, and detoxification. They conduct a throughout analysis of their client that not only includes their diet, but their lifestyle, work habits, emotional history, and environmental exposure to toxins. Holistic nutritionists are not government regulated; however, practitioners have diplomas as a registered holistic nutritionist (RHN) and certified nutritional practitioner (CNP). Homoeopathy; A system of alternative medicine based on a doctrine of like cures like, a claim that a substance that causes the symptoms of a disease in healthy people would cure similar symptoms in sick people. Homoeopathy is a medical system based on the belief that the body can cure itself. It uses a tiny amount of natural substances like plants and minerals, believing that these stimulate the healing process. Homoeopathy claims that; ‘’like cures like’’, dilution increases potency, diseases caused by miasms. Homoeopathy is a safe, gentle and natural system of healing offered by the wellness providers in WellnessWrx. Hypnotherapy: Hypnotherapy, or hypnosis, is a therapy where a licensed and certified hypnotherapist guides the client into relaxation and also uses the power of suggestion to help explore the physical or emotional ailments of the client. Hypnotherapy can be used to treat many health problems, including anxiety, depression, stress reduction, chronic pain, irritable bowel syndrome (IBS), obesity, quitting smoking, insomnia, and much more. Osteopathy: Osteopathy is a non-invasive, manual therapy that helps improve the health of a client by manipulating and strengthening the musculoskeletal framework. Osteopaths will focus on the spine, muscles, and joints. Treatment also has a positive effect on the lymphatic, circulatory, and nervous systems. As a result, osteopathic physicians can help treat a variety of health problems, including arthritis, headaches, back pain, postural problems, and digestive issues. Psychotherapy; This is required for individuals in any form of emotional distress. Physiotherapy; This assists in the restoration, maintenance, and maximization of an individual’s strength, function, movement and overall wellbeing. Rehabilitation, injury prevention, promotion of health and fitness are inclusive. Reiki: Reiki is an ancient Japanese energy healing therapy that is based on the principle that “life force energy” can be channelled into the client with a light touch or hovering the hands over the client’s body. As a result, this activates the natural healing processes of the body and restores emotional and physical welling. Reiki has been found to reduce stress, fatigue, pain, anxiety, and mood problems. Trichologist: As a branch of dermatology, a trichologist is a hair and scalp specialist. They are able to diagnose and treat hair and scalp conditions, including baldness, hair thinning, or diseases of the scalp. A part of total health that deals with human emotions. To be emotionally healthy is to be in total control of your thoughts, feelings and behaviours. It may not mean being happy but be aware of emotions. Sadness, stress or anxiety are threats to emotional wellbeing, and the inability to cope with all these affects the health of an individual. Emotional wellness is obtainable by stress management, positive thinking, accepting mistakes, support and so on. Emotional wellness plays a significant role in the life of an individual, in terms of productivity and performance at live events. Making a referral to the world health organization, mental health is a state of wellbeing in which individuals realize their abilities, can cope with life stress, can work productively and is able to contribute to the community. Mental wellness is an important part of total wellness and is obtainable through adequacy in dealings that involve life balancing. A state of wellbeing and the ability to perform in various sports sectors, occupation and daily activities is physical wellness. In this sector, proper nutrition, exercise and rest are essential. It aims at building endurance, flexibility, strength and fitness. To be physically well, tobacco use, drug abuse, excessive alcohol consumption are habits to be avoided. A personal activity involving values and belief’s provides purpose in one’s life, guide the norms and serves as a check for morals and personality. Meditation, the capacity of love and forgiveness, positive thinking, study, religious laws and the likes are the tools required to achieve spiritual wellness. These tools are antidotes to depression, anxiety, and other factors threatening wellness in general. If you’ve begun your journey into holistic wellness, or it’s new to you, always reach out to professionals who are accredited and insured in their expertise. Ask how… Wellnesswrx gives choice and guidence in growing you forward to being the best you choose to be! WellnessWrx is a platform that makes total wellness easy to reach, it offers holistic medicine with wellness providers in the various fields, ensures conscious consumers everything wellness under one universal~roof. 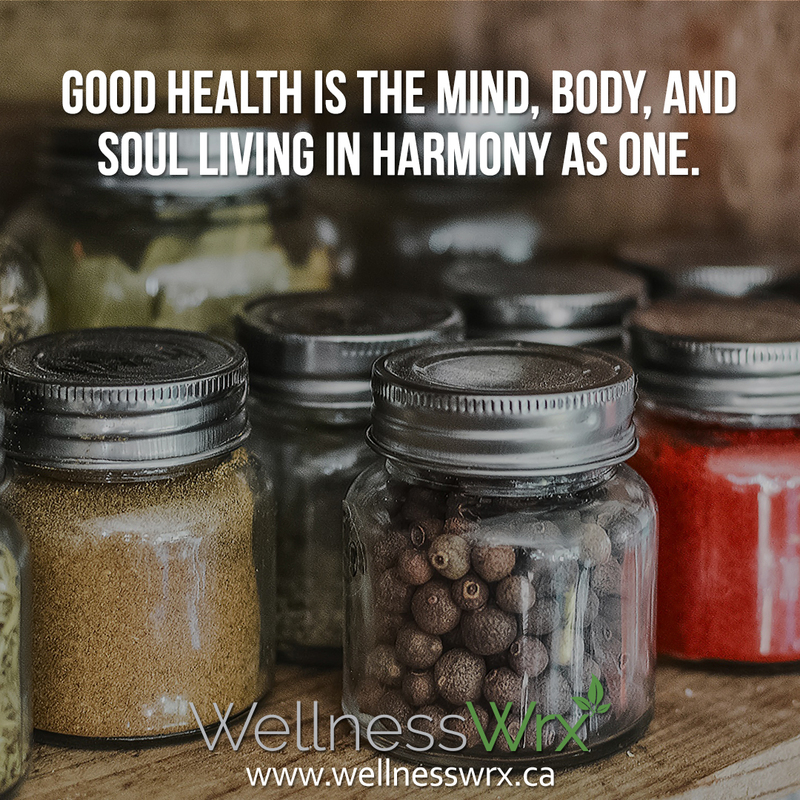 Good living is mind, body and soul living in harmony as one!